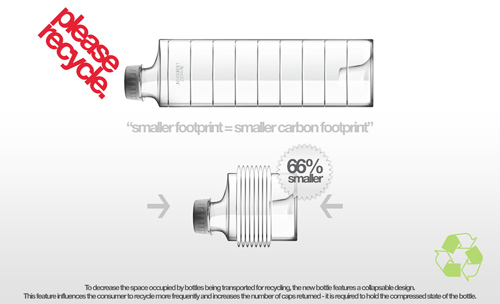 Ever wonder why soda bottles/cans are round? I had thought it was primarily because of vending machines and the need for the bottles to roll. However, it turns out the main reason for a round shaped bottle has little to do with rolling, and more to do with the physics of pressurization. 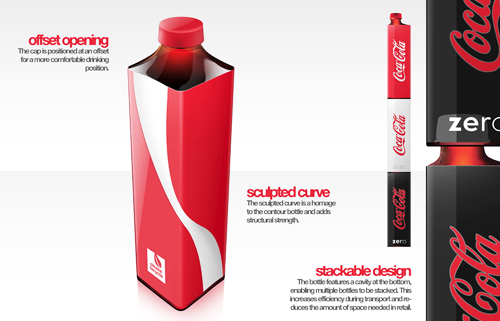 “The cylindrical shape of soda cans is not for hand comfort. 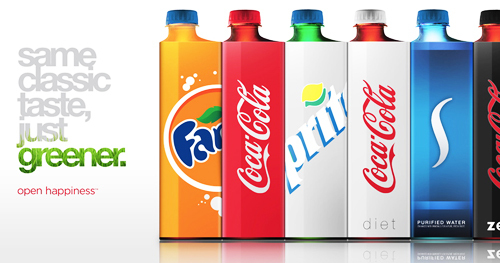 The sides of a rectangular container of carbonated soda would either bulge out or have to be made too strong and stiff to be cost-effective. The cylindrical shape resists bulging with much less material. 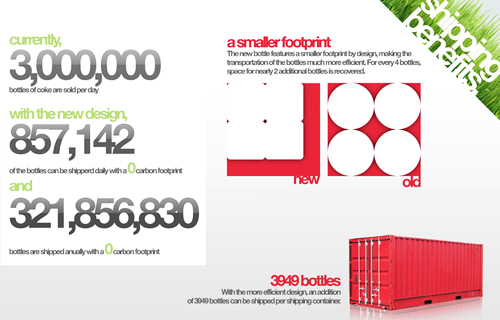 However, plastic technology has come a long way since the industry-wide design choice to go round was made decades ago. 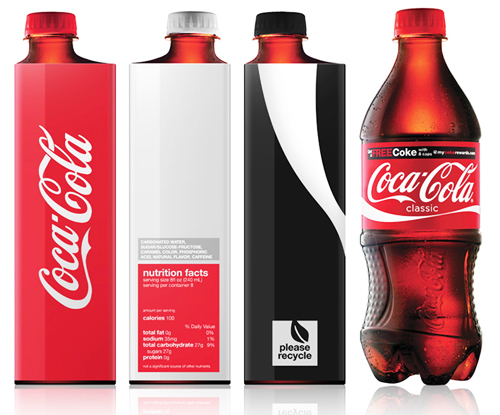 Andrew Kim, a design student from the College for Creative Studies has released a set of images from his mid-term design project that takes dead aim at revolutionizing the soda bottle. Simple, ambitious, brilliant and very square. Did you ever see that movie back in the early 90’s called Medicine Man with Sean Connery? Connery plays the part of an eccentric scientist who travels to the Amazon rainforest on behalf of a drug company. Connery is one piece of the puzzle away from finding a potential cure for cancer and that final piece is hidden in a rare species of ant and flower both only found in the Amazon. But bulldozers are clear-cutting the rainforest and Connery must race to find the flower before the bulldozers destroy all of the trees and plants in the area.Medicine Man, while merely a Hollywood production, did carry an important message. The precious value of our planet’s biodiversity could be destroyed and once it is lost, it is gone forever. As species die off, they take with them hidden secrets and potential cures to a vast array of human illnesses. While Canada is at risk of losing several species, a more dire global warning was released today from the United Nations. Earth’s organisms offer a variety of naturally made chemical compounds with which scientists could develop new medicines, but are under threat of extinction, said Achim Steiner, executive director of the U.N. Environment Program.”We must do something about what is happening to biodiversity,” Steiner told reporters. “We must help society understand how much we already depend on diversity of life to run our economies, our lives, but more importantly, what are we losing in terms of future potential.” Steiner was announcing the conclusions of a new medical book, “Sustaining Life,” on the sidelines of a UNEP-organized conference in Singapore. The book is the work of more than 100 experts, its key authors based at Harvard Medical School’s Center for Health and the Global Environment, and it underscores what may be lost to human health when species go extinct, Steiner said. In the movie version of this biodiversity crisis, Connery loses the race, the bulldozers destroy the vital patch of rainforest, and the village where the research was being collected is burned.This makes me think of another quote from famous American biologist Jonas Salk. He said, “if all insects on Earth disappeared, within 50 years all life on Earth would end. If all human beings disappeared from the Earth, within 50 years all forms of life would flourish.”According to the United Nations report issued today, Jonas Salk may be right. There are currently 16,000 species on the brink of extinction. 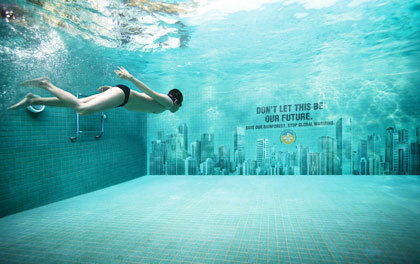 This local global warming campaign from Malaysia was painted directly on the tiles of a swimming pool. Brilliant. Stephen Harper deserves some credit for putting Canada’s arctic sovereignty on the policy and federal funding radar screen. However, I still question whether we’re being aggressive enough on this issue, especially in lieu of those land-grabbing Russians. We’re probably less than 10-15 years away from the Northwest Passage being ice-free for part of the year making it a legit shipping channel and shorter alternative than the route via the Panama Canal. The ramifications both politically and financially of a viable northern passage shouldn’t be underestimated. Not to mention the vast unknown natural resources that will inevitably be discovered once the ice recedes. I totally respect the Russians for their foresight and ambition, but Canada had better be ready to defend her territory. In disputes like this it often boils down to ‘use it or lose it’, and we have done little to strengthen and legitimize our arctic borders to date.